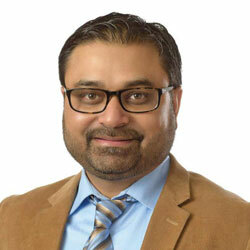 Dr. Ansari is ABPN Board Certified in Neurology and ABEM Board Certified in electrodiagnostic medicine. He holds a Master's in Public Health. He holds a BS from the University of Michigan. He attended Medical School at the University of Saint Eustatius School of Medicine. His Neurology residency was at the University of Nebraska/Creighton University, Omaha, Nebraska. He completed a fellowship in Clinical Neurophysiology in Neuromuscular/EMG at Wayne State University – Detroit Medical Center, and was Assistant Clinical Professor of Neurology at the University of South Dakota. Dr. Ansari's primary clinical interests are neuromuscular and electrodiagnostic medicine.